I admit it – I am a travel magazine junkie. Not the online version…the old fashioned print model. I always pick up a new one when I’m at the airport, and probably subscribe to half a dozen. It’s an exciting day when a new issue arrives in the mailbox. I’m curious…am I alone? Do others share my obsession? Since I received the gift subscription that started my travel magazine obsession, Budget Travel has ranked at the top of my list. It always includes practical advice for independent travelers. As the name implies, staying within a budget is important. My favorite columns are the road trip feature (I’m definitely taking those Utah trips someday) and reader tips. This magazine appeals to my practical side. Solo travel tips, making the most out of mileage reward programs, traveling with pets, house swapping. In addition to the practical advice, of course there are features on various destinations. While reading the recent issue on Iconic America, I was pleased to note that I’ve already visited over half of the epic destinations. I just need to get that western U.S. national park trip under my belt and I’ll be well on my way to completing the list. I’ve gone back and forth on this magazine…subscribing and unsubscribing over the years. It covers travel topics that interest me…good food, unique culture, unknown locales. But it all seems to be on a budget and luxury level that just aren’t me If you enjoy staying at luxe hotels that might run $400+ a night, this magazine is for you. I just need a clean, comfortable bed in a safe, conveniently-located neighborhood. I am not a luxury traveler, so the subscription to Travel & Leisure may not be renewed, but I will surely pick up an issue at the news stand now and again. Launched in 2010, Afar is all about unique travel experiences “far and wide”. Afar helps this travel nut discover new destinations. This says a lot for someone who grew up on National Geographic. Not the kid’s version, either (although that is quite good as well). Want to stay in a cave hotel in Italy’s cave city? Truly experience a new culture? Know where to see the great macaw migration? This is the magazine to read! Strange…I am really drawn to the advertisements in National Geographic Traveler. Lots of adventure travel outfitters get the word out through this magazine. It’s another one of my subscription mainstays. Similar to Afar in content, but with a bit more focus on the historic aspects of featured destinations. Not a travel magazine per se, but I know very few travelers that are not interested in capturing their experiences with photos. Outdoor Photographer is well beyond my current photography skill level, but I intend to add a digital SLR to my camera arsenal someday, so I’m trying to build some knowledge. Of course, the frequent landscape photos are fun as well. Gotta love the name of this mag. Garden & Gun definitely gets your attention. This one is all about the culture, food, and people of the American south. This is such a great place to discover…full of history such as how Nascar got its start in the moonshine business (ok, that’s out there) and the best BBQ joints to check out on a road trip. Spring has sprung and I find myself thinking about gardens more and more. My absolute favorite (of those I’ve visited thus far) is Longwood in Kennett Square, Pennsylvania. Lucky for me, it’s nearly in my backyard. One cool thing about Longwood is you can visit at any time of the year and there will be something unique to see. There are the water lilies, fountain shows, concerts, and outdoor blooms in summer. The chrysanthemum creations in the fall, and unbelievable lights and decorations at Christmas. Longwood has a huge (I mean huge) conservatory where gardeners keep displays going year-round. The grand scaled palm room, the desert themed silver room (my favorite), the sweet fragrance and eye appeal of the orchid room, and the rainforest mood in the cascade garden. And there’s more! Trees and bushes in miniature at the bonzai display, all kinds of playful creations in the children’s garden, and hibiscus and rose rooms. I continue to be amazed at what the master gardeners at this former Dupont estate can do. Many of the plants grown here are custom hybrids that cannot be found elsewhere. When visiting in summer, I always head straight for my favorite place in the gardens…the garden walk. The plantings along this brick pathway are grouped in four colors schemes, so as you stroll along, the colors change from blue to red to yellow, and finally white. At the end of the garden walk, enter the woods where rhododendrons and azaleas bloom in May-June. Continue through the woods to the formal Italian water garden. This ranks as my second favorite place at Longwood. When I held an annual pass, I’d stop in just to take this stroll through the garden walk and to the Italian water garden. Another feature I always explore in the summer is the outdoor lily display. You will be amazed at the size of the pads on the Longwood hybrid water lilies. Water lilies are such perfectly formed flowers. There are day blooming and night blooming lilies here so there always seems to be new eye candy to discover. On a recent trip, I discovered a new addition to the gardens: treehouses. There are three interspersed throughout the outdoor adventure, and they include benches for the adults to sit a spell while the children play in the giant-sized treehouses. Other activities for children at Longwood include the indoor children’s garden (open year-round) with its playful water features, hideaways, and clever activities. Children also enjoy the “animals” in the topiary garden. There are often special activities for children as well, such as pumpkin carving and pot-a-plant. Check Longwood’s schedule for all kinds of activities for children and adults. The grandest area at Longwood is the Main Fountain Garden. While it’s quite enjoyable to walk amongst the 5 acres of fountains during the day, the best time to view them (in my humble opinion) is during the Festival of Fountains. Longwood stays open late on Fridays and Saturdays in summer, and does a multicolor illuminated fountain show set to music. I find it hard to choose a favorite between this and Vegas’s Bellagio fountains. The Brandywine Valley, where Longwood Gardens is located, has many more places to explore. I highly recommend taking a scenic drive south on Kennett Pike (Route 52) between Kennett Square, Pennsylvania, and Wilmington, Delaware. This is the journey the Duponts took as they visited their country estate. You’ll pass by Winterthur and Hagley, two other Dupont properties available for exploration. As you approach Wilmington, pick up Route 141 north to Route 100 north. This will bring you back to Route 1 where you started. For more scenic driving, continue north on Route 100 for a spell. Join the conversation below! Which estate should I visit next? Yes, Galveston has a Mardi Gras, too. Who knew?!? Complete with parades full of marching bands, costumed krewe members on floats, and the roller derby team. Oh, and how could I forget…Mardi Gras beads. We developed quite a collection at the parade. We opted for the “family friendly” parade held mid-day on Saturday. Wow – the family friendliness dissipated when the beads began flying off the floats. In case your mind is going down the wrong path, I want to be clear that indecent exposure was not involved here. It’s just that we all seemed to lose our minds when we saw a string of beads flying through the air. I think I took a couple of elbows (and maybe dished out a couple myself) while trying to build up my collection. After the parade, we headed to the historic downtown where pedestrians begged for Mardi Gras beads to be thrown from the second story balconies. Every store seemed to have costume masks and feather boas for sale. We added to our collection then headed down the street to listen to live music on the corner. We spent half a day at the Mardi Gras, so we barely scratched the surface of the activities available. For 2011, the Galveston Mardi Gras boasts 5 masked balls, 13 balcony parties, 18 parades, and 26 concerts. There is also a beachfront carnival along the infamous Galveston seawall until midnight every night. That’s a lot of entertainment to explore! Galveston’s 2011 Mardi Gras was held February 25th through March 8th. The 2012 event is February 10th through February 21st. Not far from the city center where I explored the San Antonio River Walk, The Alamo, and El Mercado marketplace, I arrived at the San Antonio Botanical Garden via the trolley system. This day of adventure started on board the trolley. This is where I met the Pentecostal women. Seriously, this is what they dubbed themselves. This sweet group of ten ladies was laughing and having a lively conversation. They were gracious to let me join them. We enjoyed each others’ company over lunch and a stroll through the gardens. I rank this as one of the top two advantages of solo travel…you’re more likely to connect with people along the way. The other advantage I really appreciate is the ability to change plans at a moment’s notice (no offense to my traveling buddies…there are many advantages of group travel as well). This was the third group of women I met on my San Antonio journey, and the most memorable. I’ll be sure to look them up when I get to Alabama someday. Looking forward to enjoying fish fry at one of their restaurants. Arriving at the gardens, I looked forward to discovering its most intriguing feature…the conservatory designed by Emilio Ambasz. The cone shapes and abundance of glass surrounding a sunken courtyard are juxtaposed to the natural feeling of the gardens. The gardens are on the site of a former limestone quarry and waterworks. Nice work with the conversion, I’d say. There’s a Japanese garden with a nice stroll through the woods, rose garden, a pond with the requisite water lilies. and a very fitting cactus and succulent garden. Concerts to enjoy in the summertime. And of course the conservatory. Let’s not forget about that. Complete with a palm house. One of the Catholic Missions...errr...birdhouses? I want these in my backyard! Fashioned after the five area missions. Turn right as you enter and look for them in the woods. Did you know that cacti bloom? Beautiful! Another cactus bloom. Prickly with petals. Now, this trip occurred in July, so it was quite hot in the midst of the day. I used my own advice, taking it slow and drinking plenty of water. Ok, maybe this wasn’t true when I climbed the observatory tower at about 3:00 in the afternoon. I had to take a rest lest I pass out! Exhaustion accompanied me as I headed back to the bus stop to catch the last trolley of the day. Five Catholic missions were established along the San Antonio River in the early 1700s. I visited four during my exploration of this historic Texas city. 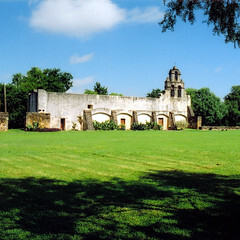 Catholic missions are part church, part farm, and part fort, and were established to expand Spanish influence north from Mexico. They are found throughout the American Southwest. Let’s start with San Antonio de Valero, the first Catholic mission established in this area. This is also the place where men such as Jim Bowie and Davy Crockett made their last stand against the Mexican Army during the Texas Revolution in 1836. Better known as The Alamo, and abandoned by the Catholics at the time of the historic battle in which all 189 defenders of Texas died. Their sacrifice inspired others in Texas’s fight for freedom from Mexico. An IMAX movie about the battle is offered at the nearby Rivercenter. The four other Catholic missions in this region are active parishes and part of the Catholic diocese of San Antonio, centered at the San Fernando Cathedral on San Antonio’s main square. Interesting…while they are active parishes, they are also part of the U.S. National Park System. You can reach the missions by bus or car. There is also a bike trail. I wouldn’t recommend the bike trail in the heat of the San Antonio summer, but it’s sure to make for a good day out at other times of the year. If possible, organize your travel schedule so that so that you can participate in Sunday’s Mariachi Mass at Mission San Jose. Arrive early and explore the grounds. You’ll get a good feel for mission life here. I felt like I was transported to the 1700s. Many of the original exterior walls of the mission still remain, as well as a working mill and granary. Known as the best-preserved mission in the area. Be sure to check out the frescoes. This mission was an important supplier of food and hides as far away as Louisiana and Mexico. 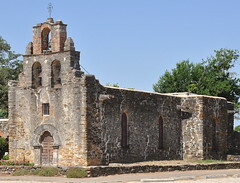 As of January 2011, the National Park Service is in the process of renovating several of San Antonio’s missions. The church at Mission San Jose is currently undergoing renovation, and Mission San Juan is scheduled for renovation later this year. On my docket for several years now. I actually planned a trip here once, then ended up taking an awesome road trip in Arizona instead (long story). But Yosemite’s waterfalls and granite monoliths are still calling my name. This is a May-June trip, at the height of the waterfall season. A few days in San Francisco will provide some city time to balance the wilderness of Yosemite. Off to meet fellow travel bloggers at #TBEX. Definitely getting out to the mountains and onto the water. Hiking Grouse Mountain and kayaking at Indian Arm sound good to me. This itinerary is all planned out on paper. An eleven day road trip with highlights to include hiking the Virgin River Narrows in Zion National Park, a descent to explore slot canyons at Antelope Canyon in Northern Arizona, and admiring the pink sand at Utah’s Pink Sand Dunes State Park. There is sooo much to see in this region. Adding to the itinerary…sandstone hoodoos at Bryce Canyon, a “fold” in the earth at Capitol Reef National Park, more slot canyons at Grand Staircase National Monument, and admiring the reds, browns, and golds of the desert southwest at the aptly names Kodachrome Basin State Park. This one is a fall trip, ideally September to avoid the summer crowds. But the main purpose for taking this trip in the fall is to hike the Virgin River Narrows. This is when the water is lowest and warmest, which is important because a portion of this trip is a hike *in* the river. It’s actually two trips to Germany. Oh, let’s just make it a three month trip to Europe that will be bookended by Germany. First, Oktoberfest, the ultimate bierfest (spelled the German way, of course). Oddly enough, it takes place primarily in September. We’re traveling to Munich for this one. It’s not all about beer, you know. In fact, the only place that beer takes center stage is in the name of the event. 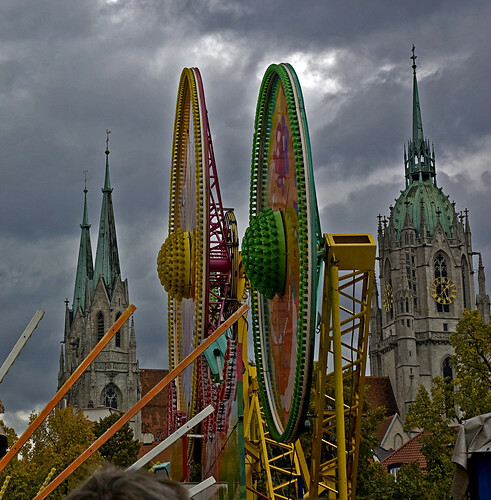 I’m here for the bratwurst, parades, music, dancing, carnivals, and exploring Munich. After Oktoberfest, perhaps I’ll be off to Alsace Lorraine on the border of France and Germany. A cruise on the Rhine River. Explore the fortresses. Fill up on the gastronomic creations of this unique region. Discover the architectural beauty of the historic town centers. Or maybe my travels will take me south to Prague, a city that survived destruction in WWII. More intriguing architecture to be explored. The Charles Bridge and Prague Castle. Beyond Prague, it’s Vienna, Austria and Budapest, Hungary. Wow – I’m exhausted. In the midst of this journey, I might just find a good home base where I can catch up with everyone that’s been following me on my journeys. Time to care for the blog and rejuvenate my energy. December brings the end of this journey around Europe, and exploring the Christkindlesmarkts in Germany. This is my chance to discover more of the historic cities and towns, purchase heirloom handmade gifts for friends and family, and enjoy local fare. 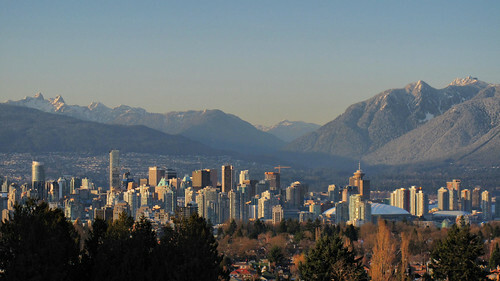 Then, it’s back to the states to deliver those gifts in time for Christmas and dreaming of new adventures for 2012. San Antonio is full of sites that fit my personality perfectly. It has history and interesting architecture at The Alamo and Catholic missions, cool neighborhoods to explore on foot, shopping with a local flair at El Mercado, and natural creations at the botanical garden. This city meets all my needs, and this trip ranks as one of my *best* solo journeys. I stayed at a hotel around the corner from The Alamo. Yes, there’s a capitol “T” in “The” when you’re speaking of The Alamo. Texans hold The Alamo in a place of prestige and honor. No photography inside, and men must remove hats. This is where men such as Jim Bowie and Davy Crockett made their last stand against the Mexican Army during the Texas Revolution in 1836. Their sacrifice inspired others in Texas’s fight for freedom from Mexico. Here’s an interesting tidbit about The Alamo…the facade that we so readily recognize was not complete at the time of the battle. And…that facade is on the church, not the entry to the fort. In actuality, much of what you see at The Alamo is not original. Ok, hope I didn’t burst your bubble there. There are many period pieces in the museum on the grounds. Walk across the street from The Alamo and check out a piece of the original wall of the fort, under a piece of plexiglass in the sidewalk. In addition to its reputation as home of The Alamo, San Antonio is also known for its river walk. This area of walkways, restaurants, and shops below street level was originally built as a flood control after the San Antonio River overflowed its banks and claimed 50 lives. Much of the development was funded by the depression-era WPA. I highly recommend one or more strolls on the river walk (I took many). A boat ride is a great way to get around and get your bearings as well. Next stop – Catholic missions. First, it’s San Antonio de Valero. Oops, we’ve already been there. It’s otherwise known as The Alamo. Yes, The Alamo is one of the five missions in San Antonio. Check out the mariachi mass, grist mill, irrigation system, and well-preserved grounds at Mission San Jose. And the frescoes that remain at Mission Concepcion. All easily accessible via mass transit. In fact, everything I did in San Antonio was reached by walking or by bus. There’s a wonderful trolley system that services the downtown area, and your standard bus transit system for the outlying areas. One of my favorite accidental finds was La Jalisco, an independent Mexican restaurant in San Antonio’s main square. Filled with about 75 people on a Saturday morning, with Spanish as the primary language, La Jalisco serves up a yummy steak quesadilla with refried beans. Also on the main square, you’ll find the San Fernando Cathedral, the final resting place of Davy Crockett and Jim Bowie. The alters in this cathedral are spectacular. From the main square, it’s a short walk or trolley ride to El Mercado, the Mexican Marketplace. My discoveries here included a traditional Mexican dance exhibition, and garden planters hand-painted with bright sunflowers. Let’s make one last stop before leaving San Antonio…La Villita. “The Little Village” is an artist’s village and San Antonio’s oldest neighborhood. At the entry to La Villita from the river walk, you’ll find the Arneson Theater. Seating is on one side of the river, while the stage is on the other side of the river. Very unique. La Villita presents all kinds of artists and galleries, eateries, and a cute little church in a compact neighborhood. I happened to visit the year before Larry Williams, the village glass blower, retired. During his 50+ years of artistry, he made a fully functioning carousel out of glass. It is now in the Witte Museum…check it out if you get a chance. In this long-awaited episode, we travel to northern Death Valley National Park in California, and go on some backcountry adventures. We took a journey through southern Death Valley in Part 1 of this series. Comment below to let me know what you think! Which parts of Death Valley sound most intriguing to you? Subscribe via email, RSS, and/or iTunes so that you’ll know when the new episodes are released. If you like what you hear, please leave a 5 star review on iTunes. This will help increase the podcast’s ranking. Thanks for your support! Where to travel at Christmas? There’s no need to go the whole way to Germany for the Christkindlmarkt, although the world famous Nuremberg Christkindlesmarkt with its wooden stalls full of baked goods and Christmas arts and crafts sounds like a blast. Instead, I might just head to Chicago for the Christkindlmarket in Daley Plaza to enjoy traditional German food, practice my German language skills (as minuscule as they are), and be blessed by brass bands playing Christmas music. But in Germany, it’s possible to travel from town to town to explore the many markets, as most German towns uphold this tradition. I recently heard about the Medieval Christmas Market in Dresden on an episode of my favorite travel podcast, The Amateur Traveler. There are other Christmas markets in Dresden, too. In fact, they have an area called the Christmas Mile. Hmmm…how much distance is there between Nuremberg and Dresden? And how many other German towns can I stop in on the way to enjoy mulled wine and buy handmade goods? Rockefeller Center with its huge Christmas tree, ice skating rink, and 70,000+ lights is an obvious draw. Then there’s the Rockettes Christmas show at Radio City Music Hall. I’d have to check out the window display at Macy’s, where they depict scenes from Miracle on 34th Street. The other fancy department stores are known to have amazing window displays, too. Up near Tiffany’s on 5th Avenue, I’ll check out the big crystal snowflake. Hey, I had no idea there were Christmas Markets in NYC. And of course the trip could be extended to include the big party in Times Square on New Years Eve. The ball drop must be more interesting in person, right? I listen to a lot of travel podcasts. One of my other favorites is the Indie Travel Podcast, produced by two Kiwis, Craig and Linda Martin. I recently listened to an (older) episode in which they talked about Christmas traditions in New Zealand. Just the thought of celebrating Christmas during summer seems foreign to me. How about a picnic at the beach on Christmas day? Sounds like fun! Closer to home, there’s Christmas Street in Baltimore, Maryland. A festival of lights in the neighborhood at 34th Street. Really close to home, there’s Longwood Gardens in Kennett Square, Pennsylvania. I’m just throwing this one in there for all of you out-of-towners that will read this post. I’ve actually been to this one several times, and will continue to go back as long as I can get someone interested in exploring (hint, hint). Local florists and artists design Christmas trees in themes for the various rooms in the garden conservatory. Local students do a fantastic job on their themed trees, which are featured in the greenhouses. I’ll never forget the first time I saw the lit snowflakes hanging from the trees in the garden, and the shrubs that had been transformed into “flowers” with lights. It is really hard to imagine or describe, and especially hard to photograph (sorry!). Well worth the trip and a great bargain at about $20 admission. What other adventures would you recommend at Christmas? Please comment below! Largest home in the United States. 250 rooms. 8,000 acres. This is the Biltmore estate in Asheville, North Carolina. While the French chateau is quite impressive, the estate has a lot more to offer. Walk through the gardens. Take a horseback ride. Or walk your dog. Yes, dogs are allowed to visit the estate, too. They can’t go in the house, but they’re welcome to visit the gardens with you. I love it! The Biltmore Estate was opened to the public during the depression by George Vanderbilt’s daughter with the intent of raising funds to maintain the estate and drawing tourists to the area. They continue to expand the attraction, with a shopping and dining village now onsite, as well as a winery. Be sure to stop in for a free wine tasting. I visited the Biltmore in the fall, long after the height of the bloom season. There were still plenty of beautiful plants and flowers to see in the gardens and conservatory. While the myriad of roses in the walled garden and famous collection of azaleas must be fantastic in June and July, the late summer show from the cannas, grasses, and coleus was mesmerizing as well. As you enter the estate and make your way towards the mansion, you will drive through a serene woodland area that was fully planned and established as a naturalistic garden. Experienced gardeners will recognize it as a planned experience, but this does not detract from the peace that you feel as you travel the one-way lane on your way to the mansion. In the immediate vicinity of the mansion, there are four main garden areas…the Italian water garden, the natural garden, the walled garden, and the flower carpet. The flower carpet warrants a bit more explanation. It is a sunken garden area adjacent to the mansion that is replanted every year in a different design. The year of my visit, the flower carpet was planted to depict a stained glass window. There is also a wonderfully designed conservatory adjacent to the walled garden. The first thing to greet me inside the mansion was the winter garden conservatory. It’s one of my two favorite places in the mansion. The glass dome with rich wood frame was spectacular. The other place I really love is the indoor pool in the basement. I’m not sure why it intrigued me so much. Maybe because it was so cozy with the white tiles, close ceiling, original lighting, and the adjacent dressing rooms. I’m sorry you won’t see any pictures from my tour of the mansion in my post…photos are not allowed indoors. What intrigues you about the Biltmore? Have you been there? Hope to go someday? Do you think it’s over the top? Add your comments below!